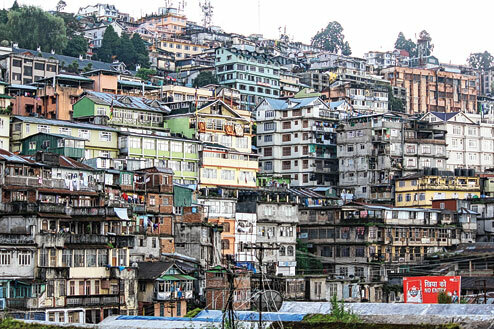 Over 300 buildings in eight of Darjeeling's 32 wards, including the Gorkha Rangamanch Bhavan where Bimal Gurung sits as GTA chief, have exceed the municipal corporation's stipulated height of 11.5 metres, the Darjeeling civic chairman said today. Municipality officials said the figure was expected to be even higher in these eight wards as the civic officials had not been able check some of the buildings whose owners were out of town. The wards where the survey was carried out through road chowkidars are in the Chowrasta, Chowk Bazar and Judge Bazar areas. Of the prominent buildings that are on the list of 337 flouters are the Rangamanch Bhavan, the Jai market complex and the Darjeeling telephone exchange. Under the Bengal Municipality Act, houses cannot be built higher than 11.5 meters in Darjeeling. The Rangamanch Bhavan has seven storeys and rises to 18 metres from the ground, civic body sources said. Civic chairman Amar Singh Rai today said: "So far, we have more or less covered eight wards, out of the 32 in Darjeeling and we have already found that there are 337 illegal highrises. It will take some time before we complete the survey in all the 32 wards." A civic official said it was apparent that one in every three buildings in the Darjeeling town area had flouted the height restriction. Municipal officials said it was not just private buildings, but even government buildings, institutions and social organisations had also flouted the norm. "This is not today's problem. Every successive board in the municipality for the past 23 years has turned a blind eye to this building menace. Even the general public is to be blamed as they only talk about rules and regulations when it comes to construction by other people but when they themselves have to construct their houses, they do not even think once of violating the restriction," said a municipal commissioner. The past board had come up with a scheme in which illegal houses could be "regularised". But Rai said this was unacceptable. "The earlier municipalities probably regularised the buildings (by imposing a certain fine) but just because some illegal structures have been regularised by the previous board, we cannot classify those as legal structures. The municipalities probably imposed a fine to regularise the buildings because these illegal structures were also using civic amenities," he said. The Darjeeling municipality has decided to start issuing showcause notices to the owners of the illegal structures. Recently, the civic body demolished two floors of two buildings that were beyond the height regulation. Whether this will be followed for the 337 other buildings is unclear. "The survey will continue but we will start taking legal steps. We will first issue a showcause notice and seek a written explanation from the owners," Rai said. "We are holding another meeting on August 17 where our next course of action will be decided," said Rai.